As the innovator of 1930s reproduction fabrics, Julie Rothermel continues the tradition in 2018 once again by "creating something old from something new" in her new Aunt Grace Baskets of Scraps collection from Marcus Fabrics. Inside the patchwork border, appliqued blocks mimic the look of English Paper Piecing without the extra work. BOM includes fabric for either a queen or king option. 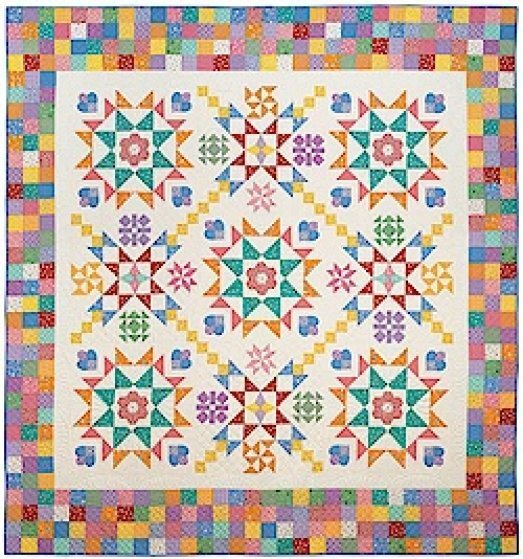 This quilt finishes at 90.5" x 96.5" for a Queen size quilt or 96.5" x 102.5" for a King size quilt and includes the book, over 21 yards of fabric and applique templates. Price is $24.98 plus shipping (if applicable) per month for 9 months. Use the form below to sign up - be sure to fill in the BOM choice!